This week’s Page Presents show featured the book, Feliciana Feydra LeRoux Meets d’Loup Garou: A Cajun Tall Tale, by Tynia Thomassie and illustrated by Cat Smith. Feliciana is a feisty little girl and the youngest in a family of older brothers. One day she is particularly full of beans and has such a bad day that she and one of her brothers (who had been in charge of keeping her out of trouble) are made to stay home while the rest of the family goes to the fais do do. Her brother is so miffed that he has to miss the dance party because of her, he taunts her that the dreaded loup garou (Cajun werewolf) will get her. When she hears a howl outside her window, she is sure that her brother ti-Jacques is trying to scare her, so she runs out into the swamp in hot pursuit. There she meets up with a real loup garou. When she confides her troubles, he tells her that howling at the moon always makes him feel better. They do some companionable howling, and the story ends happily. My oldest doll, that my mama made for me, played the part of Feliciana, and I made a not-too-scary Loup Garou puppet. I decided that this week would be a good time for another open-ended craft. I asked the kids make a mask to answer the question: Who Is the Loup Garou? I found a wolf mask template that I really liked. It had a jiggly, hand-drawn outline and a kind of rakish simplicity that reminded me of outsider art. I gave everyone a copy of the mask template and a small paper plate. They could mount their finished Loup Garou face on the paper plate for a sturdier mask. I provided various kinds of paper, foam pieces, and a couple of boxes full of ribbons and trims. The kids did the rest. A colleague and fellow alumnus of the University of Washington Information School just sent me this video, featuring students and faculty at the iSchool. According to Briet, an antelope running wild on the African savannah is not a document. But an antelope placed in a zoo and made an object of study is a document, she rules. For more about antelopes as documents, see “What is a “document”? by Michael K. Buckland. Full disclosure: Antelopes also figured prominently in the class song I wrote for the end-of-term party hosted by my cohort. Last week was our Read to the Dogs / Crafty Saturday program. Towards the end, I noticed that a little girl had removed all the child-sized chairs from the small tables and had carefully lined them all up against the wall. Then she proceeded to place a stack of board books on each chair. She was bustling about up and down the row of chairs, moving the books around, rapt in her own make-believe world. Earlier in the week, I had seen an older child doing much the same thing, except she had taken all the stuffed animals and seated them in the chairs at the tables and was singing to them as she supervised their work. In this out-of-the-way corner of the large children’s room, with its child-sized tables and chairs arranged next to child-height shelving, kids have discovered a perfect space for creating their own worlds. I’m glad that our library includes space for creative play. Recently I read Susan Linn’s new book, The Case for Make Believe: Saving Play in a Commercialized World. Linn, who is a psychologist, therapist, scholar, and puppeteer, points to the rise of toys and craft kits that encourage kids to replicate someone else’s design rather than creating their own. A few years ago I was working at an university library and helping a lot of undergraduate students each semester who were in a state of panic over an assignment to go to the art museum and describe a work of art in their own words. They inevitably ran to the library and begged the librarian to find a printed description of the work in question. No amount of pointing out that the assignment clearly stated that they were to describe the work themselves, in their own words, would satisfy them. They had no confidence at all in their own ability to look, see, and describe. Was this a result of our society’s persistence in viewing the arts as unnecessary frills, and the withdrawal of funding for arts education? I wondered if this could be somehow related to the whole cult of perfection that seemed to have destroyed a lot of individual music-making. With the perfection of music created in a recording studio, people seemed to find their own performances too flawed and imperfect and just gave up making music altogether. When I inherited the Friday story-time at my library, which included a craft, I didn’t realize at first that the “craft” had previously consisted of coloring printed coloring pages. Since I was looking at the project from my perspective as a college instruction librarian who had done a lot of reading and thinking about pedagogy, I wanted to create crafts that would build on the story and provide avenues for creative dramatic play around the story theme. The transition from coloring pre-printed pages to putting together somewhat complex crafts was harder on the parents than on the kids, I suspect. I noticed that, at first, I needed to create very prescribed kits. Over time, I have done less and less pre-processing and have left more leeway for adapting and personalizing the project. Occasionally I throw in a very open-ended project. It has been thrilling to see how self-sufficient and creative the kids have become! I know I have succeeded when I see the kids playing with their personalized version of the craft project in ways that show that they are inhabiting the world of the story and making up their own dramatic variations. A number of parents and grandparents have described how their kids continue this dramatic play at home. Others have thanked me for making the process of creation a big part of the fun, with less focus on the end product. It’s important to preserve and create spaces for creativity, both physically and temporally. By Christian Bering: click image to link to his site. …and this further inspired the design for a give-away mug. Few people have any idea of the vastness of the Navajo Nation, which is the size of West Virginia. Diné College has three campuses with libraries, one in Arizona and two in New Mexico. But when I began my job as the traveling instruction librarian, students who attended classes at the remote centers didn’t even know that the libraries existed. I created flyers advertising my upcoming visits using the “Go to the Library ONLINE 24/7″ image, and I also used it (coupled with the “Out of the Clubs and Into the Libraries” image) in a Powerpoint presentation introducing them to the library. Later we created the mugs to give away to students at the remote centers. It worked! The students related to the cool edginess of the graffiti images, and they loved the 24/7 availability of so much information. Since undergraduate students are notorious for pulling all-nighters to finish papers and projects, they were thrilled to find out how much information was available to support their last-minute information needs. I also designed an information literacy curriculum based on the Diné educational paradigm, which emphasized a balanced approach for conceiving, planning, executing, and evaluating a project, and I showed them examples of the library’s outstanding collection of Navajo materials and walked them through the process of requesting materials to be sent to them. 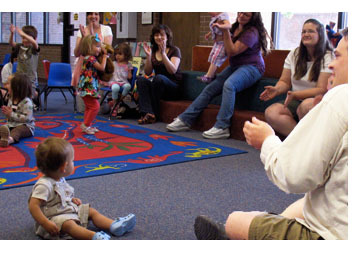 So, like every good instruction librarian, I showed them that research takes time, and I encouraged—nay, exhorted!—them to begin their research early. 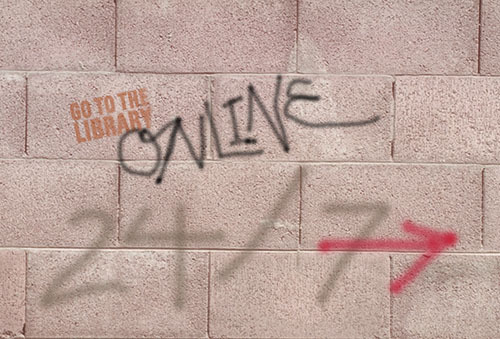 But somehow the graffiti and tips on 24/7 resources convinced them that I was on their side and was, in fact, no stranger to last-minute, late-night study sessions. 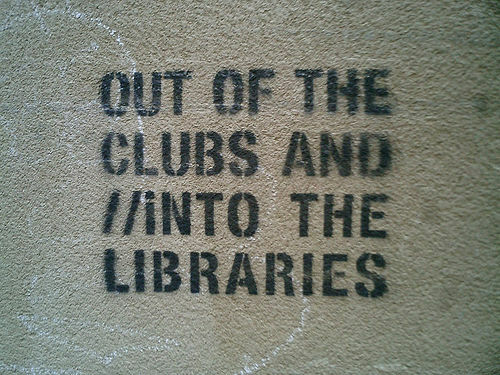 The “Out of the Clubs and Into the Libraries” image also inspired me to work with a humanities faculty member to start Friday Nights @ the Library, an open-mic community coffeehouse. This was a way of bringing the oral tradition back into the library, along with music, art, conversation, and other forms of cultural expression. And it gave me a chance to create my very first actual graffiti on campus! This week’s Page Presents show featured the book, Gator Gumbo: A Spicy Hot Tale, by Candace Fleming with illustrations by Sally Anne Lambert. Set in the bayous of Louisiana, it’s the story of Monsieur Gator, an aged and scrawny fellow who has grown sadly resigned to a vegetarian diet and the taunts and jibes of his former prey (who are all too aware that he is now too slow to catch them). This book’s Cajun lingo makes it a natural for storytelling. Because of my available finger puppets, I changed two of the small mean animals in the story. Instead of Madame Skunk, Monsieur Otter, and Mademoiselle Possum, we had Madame Skunk, Monsieur Weasel, and Mademoiselle Crow. I did my best to channel Justin Wilson, the Cookin’ Cajun. I especially love the story he tells in this show. Mr. Matt taught everyone the Hand Jive clapping rhythm (a clavé style second line rhythm used in New Orleans funk. Everyone caught on to that, so he taught us a variation, and we all clapped our way through Iko Iko. Have I mentioned that one of the things I love most about Mr. Matt’s Minute is that we get to expose kids to real music from around the world? (As opposed to kiddie music.) Don’t get me wrong, there’s some great music out there composed expressly for children. But kids love music, so why not expose them to the full gamut? I pushed the envelope a little too far with this week’s paper bag alligator puppet. I knew that kids would need some help with putting the alligator jaws together, but I made sure that there were very simple shapes that kids would find easy to cut out and paste. So imagine my shock when I noticed almost all of the parents doing all of the cutting and pasting as their kids watched! I’m guessing that the whole thing looked so complicated that the parents just took over. Even though they didn’t get to have the fun of making their own puppets, the kids still loved playing with them. We like folk art. But I never thought of myself as a folk artist. Since starting Page Presents, however, our house is beginning to fill up with LOTS of folk art…my own! My husband has begun referring to our home as The Chinet Museum. When he saw last week’s mask prototypes, he commented, “We’ll have to open up a whole new wing in The Chinet Museum! Hi, everybody! It’s me, Page! This week I got to be the star of my own show, Page Presents! Vicky and I got inspired by Verna Aardema’s book, Who’s in Rabbit’s House (illustrated by Leo and Diane Dillon). In the book, the story of Rabbit (whose house is taken over by a mysterious animal with a scary voice) is presented as a play. The actors wear animal masks, and each animal tries to help Rabbit eject the bad animal in his or her own way. Unfortunately, all of their methods involve messing up or destroying Rabbit’s house, so Rabbit does not approve. The surprise ending teaches a lesson about fear and the unseen. Vicky liked it because she got to make different sounds for the animals as they came and went. I got to play all the animals except Rabbit! I was really good, too. 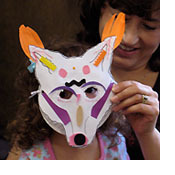 Vicky thought the kids would have fun picking out one of the “helpful” animals and making its mask. She found a really cool method, originally for making paper bag masks. But she wanted the masks to be more colorful, so she used construction paper, which worked beautifully! Check out this link to a great tutorial on making this type of mask. Frog, Jackal, Leopard, Wildebeest, and Elephant: Vicky was worried that some child might be devastated by not getting the mask kit of her choice, but everyone seemed to get the one he wanted. They had fun making their masks, and as soon as they put them on, you could see them take on the persona of their animal. I guess they learned that from me! By the way, Vicky changed one of the animals from the story. In the book, one of the animals is Rhinoceros, but Vicky didn’t want to figure out how to make rhino horns, so she changed it to Wildebeest, which had easier horns. Speaking of horns, one of the kids decided that he wanted to be a horned frog. Anything is possible in the Imagi-Nation! Oh gosh! I almost forgot to tell you about Mr. Matt’s Minute this week. Mr. Matt is Zoey’s dad, and he is a real, honest-to-goodness drummer and percussion teacher! And he’s a really fun person too. Since we were featuring another story from Africa, we got to work on the marketplace rhythm some more, and it was the best yet! This time, after he got us going with the marketplace rhythm, he added a cool counter-rhythm. They sounded awesome together! Then he taught everyone the counter-rhythm. After that he divided the audience into two groups. One group had to keep playing the marketplace rhythm, and the other group had to play the other rhythm. Then the two groups switched rhythms. You might think that I don’t get to do this, since I don’t have any arms, but I have a castanet-clicker that I can hold in my mouth. I’m getting good at it, too! Oh wow! It was really rockin’! Then Vicky put on some music, and we got to play along with our two different rhythms. It sounded great! It was a different song from the one we played with before, too. (Vicky just told me that it was “Africa” from the African Spirit cd by the Soweto Gospel Choir.) I think Mr. Matt is amazing! Here are some more pictures from this week. Space robots were the theme at this week’s Page Presents class. I taught the kids the American Sign Language sign for “robot” (robotic arm movements), and then we played Robot Commander (a robotic version of Simon Says). Matt brought a metronome for his Mr. Matt’s Minute of rhythm instruction, and as he gradually increased the tempo the kids had a blast speeding up their robot moves to stay with the beat. The Space Robot is making soft beeping noises, and, in a soliloquy, confides to the audience that he is afraid and feels very anxious about meeting his first Earthling. He exits, and then we see Page the Bookworm, on his way to the library. Page hears the beeping sound, wonders what it is, asks the audience if they can hear it. Naturally they assert that it’s coming from a space robot. Page can’t believe this, but eventually admits to the audience that they were right, after he has a close encounter with the space robot. Page tells the robot that he is on his way to the library to return his books and to check out some more to take home and read. The robot does not understand the words, “library,” “book,” and “read.” Page gets his library books and demonstrates. The space robot is excited and wants to take this technology back to his planet. Page explains that the books belong to the library and are shared by everyone, so he can’t give them to the space robot. However, he points out that there are digital versions of the books that he will download into the robot’s memory. 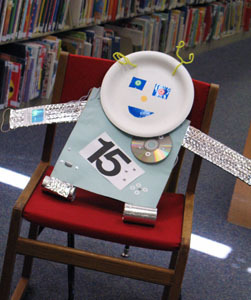 The space robot happily returns to his planet, and Page waves goodbye and rushes on to the library to tell everyone about his adventure. 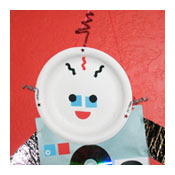 After the story, the kids made robot bodi-puppets (I got this idea from Storytelling with Puppets, by Connie Champlin). 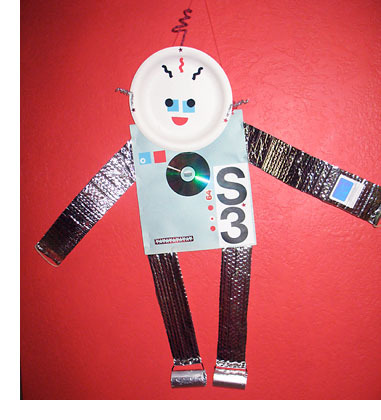 This time I remembered to tell the parents to be sure to measure the robot body parts against their child and make any necessary adjustments before stapling it together! This one belonged to a very short kid! I had been reading about Dave Eggers’ TED wish that people would engage creatively with their local public schools, and about how his fabulous ﻿826 Valencia tutoring center inspired others around the world to open. Since the original location was zoned for retail, they had to open a store at the tutoring center, and so they created The Pirate Supply Store to serve the working buccaneer. This model proved to be so successful that all the subsequent 826 tutoring centers have featured a store, including the Brooklyn Superhero Supply Co. in New York, the Boring Store (surreptitiously supplying secret agents) in Chicago, the Time Travel Mart in Los Angeles, the Greater Boston Bigfoot Research Institute (in Boston), and the Greenwood Space Travel Supply Co. in Seattle. 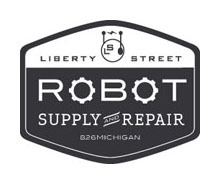 The 826Michigan center in Ann Arbor features the Liberty Street Robot Supply & Repair shop. I thought the kids would appreciate the seal of approval that a manufacturer’s label would provide for their robots. I also discovered a lot of old AOL cds in a cupboard, which would be a great feature for robots of the digital age, and I gathered together assorted stickers and labels, as well as a box of various foam shapes. We used leftover insulation from a roofing project for the arms and legs, and I created little wheels by covering sections of wrapping paper tubes with heavy-duty aluminum foil. And yes! the large letters and numbers came from my 2009 Stendig calendar. I was pleased to notice afterwards that all of the robot books I had on display before the program had been checked out…or else stolen by a space robot! I’m in love with the books of Baba Wagué Diaketé! They are a storyteller’s dream, including action, drama, songs to sing, sound effects, and characters that take on a life of their own. When I started thinking about featuring Diakité’s book, The Hatseller and the Monkeys, for this week’s Page Presents class, a vague memory surfaced of a footlocker in our storage area that was allegedly full of monkeys. When I investigated, I could see part of a hand and a foot sticking out pitifully, but the hasp was stuck. I enlisted the help of my colleague Anne, and we raided the tool drawer for something to pry it open with. As the hasp gave way, the lid sprang open, and suddenly there were flying monkeys everywhere! The locker had been tightly stuffed with 15 dogs and 13 monkeys. which burst free from their confinement explosively. Anne promptly declared that we should line up the monkeys on our staff room couch, and I gleefully assisted. Something tells me that monkeys will begin to appear frequently in the Page Presents show! It was easy to talk my boss, Linda, into taking the part of the naughty monkeys for our storytime drama, since she had recently stolen the show as the (overly) helpful fairies (plural!) in our tandem telling of Margaret Read MacDonald’s story, “The Little Old Woman Who Hated Housework” at our spring concert. In the story of The Hatseller and the Monkeys, the hatseller sets out on his way to a big festival without taking time to eat breakfast. Halfway there, he gets tired and sits down to rest under a tree. Soon he is snoring, and this alerts the monkeys to his presence. They sneak down and steal his colorful hats. When he wakes up and finds his hats missing, a hilarious exchange with the monkeys ensues, with the monkeys imitating everything he does. After being pelted with mangos by the monkeys, the hatseller takes time out to eat the fruit and soon comes up with a better idea to trick the monkeys into giving back the hats. Linda got out our big ladder, which we draped with camouflage fabric and greenery. To our eyes, it looked satisfyingly tree-ish, especially when we added the monkeys all over it. I’m not sure what the library patrons thought. I kept seeing people approach and stand there bemusedly staring at it with their mouths open. The appearance of a very tall, tree-ish ladder in the middle of the children’s room apparently had very nearly the same effect as the appearance of the Monolith in Stanley Kubrick’s film, 2001: A Space Odyssey. 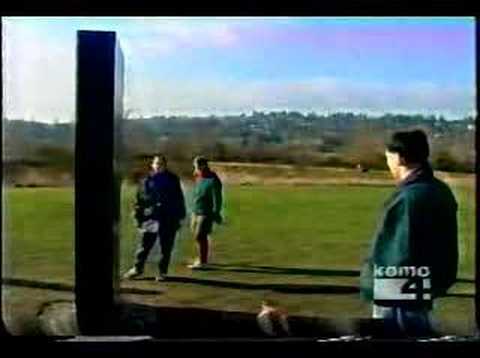 (Speaking of random acts of whimsy, a monolith appeared on Kite Hill in Seattle’s Magnuson Park on January 1, 2001, only to disappear and reappear mysteriously in other locations around town). We had a great time with our dramatization of the story, and the kids loved seeing the antics of the naughty monkeys. Afterwards the kids made kufi hats from bulletin board border trim (another storage closet find!) and construction paper. I found this idea in several places on the Web. To make the hats a little more authentic, I found a photo of kente cloth and made a couple of color prints, which I cut up for additional trim for the hats. It was a great project for the kids to make with minimal parental intervention, and they all went away proudly wearing their new kufis. Matt and Zoey were back this week, and we repeated the African marketplace rhythm from last week for Mr. Matt’s Minute of rhythm instruction. We had a younger group of kids this time, but many of them were still able to catch on to the rhythm, and the ones who didn’t were inspired to dance enthusiastically to the music (Angelique Kidjo’s “Battu” from the African Playground cd).